A group filed a lawsuit to block Edison’s plan to store toxic spent fuel at the closed San Onofre plant. A lawsuit asks a state court to order the removal of nuclear waste stored at San Onofre to the Mojave Desert. The complaint was filed before Superior Court Judge Judith Hayes in San Diego. It asks that the court revoke the California Coastal Commission’s decision on Oct. 6 to allow Southern California Edison to store 3.6 million pounds of nuclear waste at its decommissioned San Onofre Nuclear Generating Station (SONGS) in north San Diego County. “The fuel is highly radioactive and will remain so for thousands of years,” the petition states, adding the inherent risks of stored fuel within 100 yards of the shoreline. The petition was filed earlier this month against the Coastal Commission and SCE by San Diego attorney Michael Aguirre on behalf of Citizens Oversight, Inc., a San Diego nonprofit established to oversee government and corporate activities, and San Diego resident Patricia Borchmann. SCE could move the used fuel rods containing nuclear waste to Palo Verde until permanent storage is available at Yucca Mountain, a national nuclear waste repository in Nevada that was never opened, said Aguirre. Palo Verde nuclear power plant, partly owned by SCE, already has a facility for storing nuclear waste and is a better location than the shores of the Pacific Ocean, the petition claims. Licensing of Yucca Mountain, designated as a repository in 1987, was stopped by the federal government in 2010. The SCE website states that the plans are to keep the nuclear waste at San Onofre until the federal Department of Energy says to move it. “However, the federal government does not have a viable program for the management of used nuclear fuel,” according to the SCE website statement. “The statement passes responsibility to the Nuclear Regulatory Commission to regulate and manage stored used nuclear fuel. At San Onofre, the ocean’s water table would be inches away from the bottom of the proposed SCE storage structure for used nuclear fuel, the petition states. 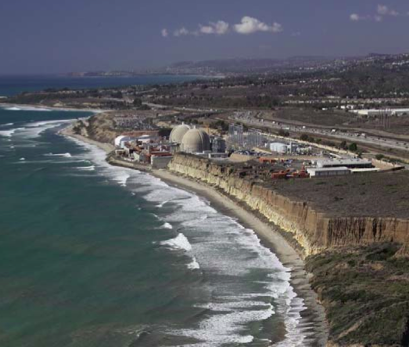 The Coastal Commission report on SCE’s request to store the nuclear waste at San Onofre states that the coast could erode 58 feet or half the distance between the existing seawall and the proposed storage facility within 35 years. Erosion could undermine the structure by 2077, the report stated. The area is also a posted tsunami zone and the site of several fault lines in the ocean’s floor, the petition states. There are 8.4 million people living within San Onofre nuclear power plant’s evacuation zone who would be affected by stored toxic fuel leak, said the complaint from Aguirre, a former city attorney for San Diego and former U.S. attorney. Unlike at any other nuclear plant in North America, a major freeway, Interstate 5, which carries more than 147,000 vehicles per day, runs within the evacuation zone, the petition state. A commuter and freight railway also parallels the coastline there. In the complaint, Aguirre claims the Coastal Commission was remiss in its duty to protect the coastline, particularly in light of the defective spent fuel rods that caused the emergency shut down of the plant in January, 2012. With throngs of residents showing support to move the spent fuel, the Laguna Beach City Council passed a detailed resolution last December requesting the U.S. Department of Energy move the waste to a permanent storage facility. Mayor Bob Whalen also sent a letter restating the city’s opposition to onsite storage to the Coastal Commission prior to its Oct. 6 decision. The city, though, has not pursued litigation, Assistant City Manager Christa Johnson said in an email. Aquirre’s petition suggests two other temporary storage facilities: Fishel located in east San Bernardino County northeast of Joshua Tree National Park, and San Onofre “Mesa,” an Edison-operated, non-nuclear auxiliary facility located within Camp Pendleton. This case is continuing to move forward and trial is scheduled for April 14, 2017.